Description: This beautiful 5-acre lake is perfect for belly boating for rainbows, browns, and brook trout. It has been reported that some of the browns are very large. 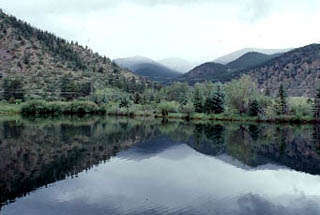 The lake ranges from 15 feet deep to nice, shallow flats for feeding trout. Location: The property is located approximately 40 minutes west of Denver, just south of the town of Empire. Capacity: Limited to 3 anglers.